Responding emotionally and honestly to the sometimes overwhelming challenges of our times takes an inevitable toll. 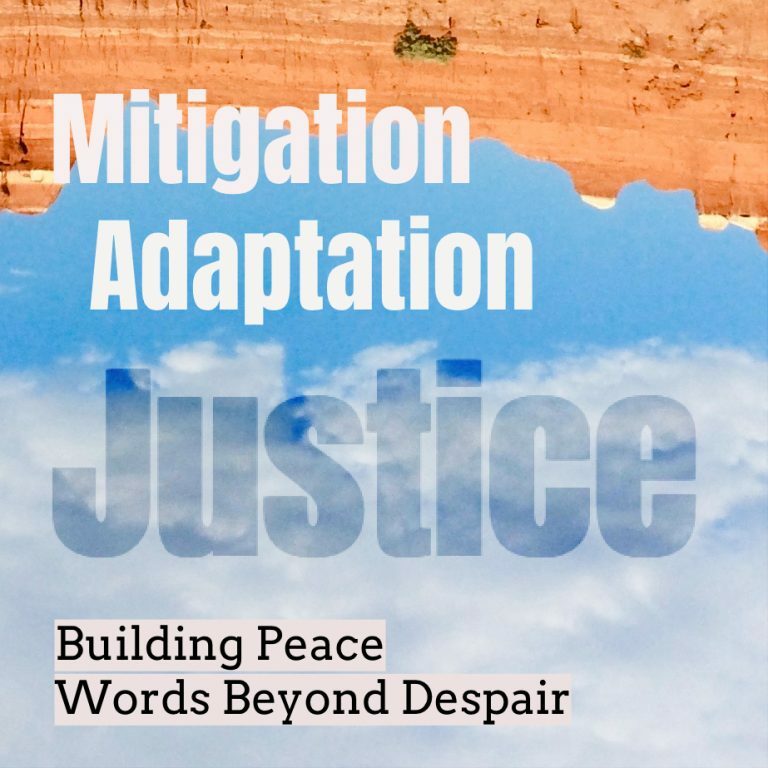 Sometimes the psychological distress that builds inside us as our knowledge of the ramifications of our destabilized climate system grows is eased by action. Participating in a public protest can be experienced as a relief valve being wrenched open at last, diffusing the toughness that has begun to collect in our body. Sometimes action only seems to encumber us all the more as the apparent futility is drilled deeper into our hearts and minds with each failed national or international gathering. With each new heavy-crude victory. With each shamefully sculpted news report endorsing the status quo. An awakened life is a hard one by definition. Systems of support are required. Edward Abbey’s important advice to activists to remain only “half-hearted” in their efforts has been quoted to me and I’ve quoted it to others. Do not burn yourself out. Be as I am – a reluctant enthusiast… a part time crusader, a half-hearted fanatic. Save the other half of yourselves and your lives for pleasure and adventure. It is not enough to fight for the land; it is even more important to enjoy it. I go back to Gandhi a lot, too. His commentary on the Bhagavad Gita, for instance, includes warnings against attachment — even attachment to seemingly noble goals, goals like decolonization. Goals like climate justice. There are good reasons for this heart distancing. Attachment of any form leads to suffering from a failure to realize a goal, or, if realized, our goal turns out to be something other than we expected. Attachment can also lead one to betray their own moral or ethical code. “By any means necessary” puts us at risk of becoming distorted people mirroring the very corrupt system we propose to protest. There’s nothing to be gained without action, for sure, but it will be a short-lived career if we add to the inevitable disappointments and setbacks by burning and badgering ourselves into illness along the way. Recognizing climate action (and informed non-action, for that matter) carries a toll, it’s important to talk about strategies for mental resiliency. Such appears to play a significant role in national treasure Mary Pipher‘s latest book, The Green Boat: Reviving Ourselves in Our Capsized Culture. In an all-too-brief review of the work, veteran environmental journalist Mark Hertsgaard (author of Hot: Living Through the Next Fifty Years on Earth, among others) lifts the veil on the offering at The Daily Beast. Mary Pipher. Credit: Angie Zegers. Anyone who has considered the planet’s human-caused condition with any depth has likely felt similarly. The book is part memoir, part psychological self-help guide, part political commentary. It’s a tricky combination, but Pipher pulls it off, writing with a homespun lyricism, quiet strength, and simple common sense that call to mind her beloved Nebraska prairies and the culturally conservative but far from one-dimensional people who reside there. By recounting her personal struggles against despair and the surprising affirmations she and a band of friends received when they decided to stop moping and start organizing, The Green Boat makes a persuasive case that both our individual well-being and our collective chances of averting disaster are best served not by trying to ignore scary truths but by facing them in the company of others and, fueled by the power of love, striving together to forge a new course. Yet reality inevitably intrudes. Children learn soon enough that loved ones die, if only their beloved pets. Television is forever showing us—and who among us turns away?—how hurricanes, tornadoes, and other disasters can leave innocent people injured, dead, or economically ruined. The psychological twist in the case of climate change is that we inflict the disaster ourselves. Hurricane Sandy was not simply one more instance of Nature unleashing its fearsome powers, just as it has done for millions of years on this planet. Humans are now helping to stir the pot. When I began to speak openly about my own decades-long struggle with depression in an op-ed and at my Depression Time blog, many who knew me assumed it was tied to my environmental work. Why wouldn’t it be? What could be more depressing than thinking about the collapse of the earth’s life-support systems day in and day out? I’ve tended to dismiss such suggestions. I didn’t want to appear to blame environmentalism somehow for my illness. In truth, my particular suffering started long before climate consciousness took hold in me. But as I’ve learned more about how depression switches on in the first place, how various forms of early trauma play havoc in the genetic switchyard making some more susceptible, I’ve begun to allow that my earliest negative impressions of our extractive culture may have planted certain seeds that made depression and panic more likely to take root. That is not to blame critical thinking. Rather, it places some portion of the blame squarely at the feet of the sickness at the root of our culture’s runaway lust for profit — a consumptive drive that ensures wealth today (to a few) by comprising our existence (collectively) tomorrow. Sadly, it should be said, is not how I see nature. When I consider the natural world (whether I imagine it declining, reviving, or simply in a static state that exists only in textbooks) my primary emotional response isn’t sadness. It is wonder. It is gratitude that I feel for having this time to simply experience the seemingly infinite wisdom of the earth and all her processes — climate disruption and biodiversity collapse notwithstanding. As I consider Abbey, and Gandhi, and Pipher (a new friend), I’m reminded that our struggle isn’t about winning in any traditional sense. It’s about seeing the wonder of nature in the world we inhabit. It is to see it in one another. It is to see it in ourselves. I’m convinced that wonder — the force that propels nearly all of those I know laboring for a habitable planet — is confirmation of that inevitable conclusion to the struggle. Still, I’d be happy to see a few more of these organizational meetings add time on their openings or closings for a good 0ld-fashioned support group. Top image courtesy of 350.org on Flickr. Egyptian green boats are courtesy of WikiCommons. Very heartfelt post. I sometimes feel very disappointed in my species too. Not all the time though. It’s true that action, like participating in a protest, does make us feel like we have some control over the future and we need to cling to this. no. not all the time. i just fear sometimes we’re not equipped to handle this acceleration and collision of global systems, these overages and shortages. that the timestamp we place on our experience is too limited, or the ubiquitous, fractured media landscape has us too disorientated. You’ve spoken my own heart, Greg. bought the book. $8 on kindle. i’ll be thinking of you as i read it.